Last year at this time, my husband and II were in Tennessee near the Smoky Mountains. It’s a gorgeous time of year there. 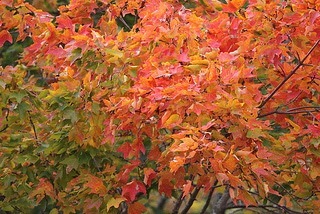 Blankets of yellow, brown, green, and orange cover the mountainsides. Crisp fall air caresses.Pumpkins are everywhere. It’s a great place to be. This year we’re living near Jacksonville, Florida. There are no mountains (or hills, even). The trees are pretty much the same as they were months ago. The temperature is cooler for here, which means it’s almost cool enough to want a jacket first thing in the morning. Do I miss the the colors? Yes. The weather? Some. Knowing it will be very cold soon? No! I love the sun, the warmth, I may write about vampires, but I’m pretty much the opposite. How’s the weather where you are? Do you like lots of sunlight, or do you hide from it? What’s your favorite season? Go visit the other blogs. There’s lots of fun and prizes! Yep, I finally did it. Don’t faint, OK? 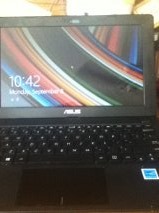 I bought a new computer. That’s all? You say. For me, this is a big deal. First, I don’t have money to spare. To pull this little update off, I had to push my single credit account into the atmosphere. I almost fainted! But I had to. It was time. OK, fine. It was way past time. I kind of use my computer almost every single day. 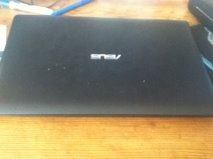 My old computer was a little Acer 10 inch that I could slip into my purse. I had everything set up the way I wanted it. I had my favorite, most useful programs all ready. It’s taken days to set up the new one It was necessary, though. My computer was about 7 years old. (Yes, 7, stop laughing). It worked pretty well, it still looked nice, and did I mention it was small and cute? But it was slow and getting slower. The cursor was jumping all over the place. The keyboard was looking rough (no idea why…) It was time. 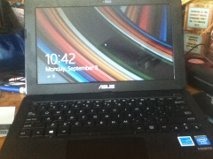 So I put my cute little baby aside and bought an inexpensive Asus laptop. It’s also black, an 11 plus inch screen. And the dreaded Windows 8.1. I was sure I wouldn’t like 8, but at least it was 8.1, so maybe they’d ironed out a few wrinkles. The weird thing: I really like 8.1. The bigger screen is great too. Easier to see what I’m doing. The keyboard is a bit stiff, but either I’ll get used to it, or it’ll loosen up—or both. Bottom line, I wish I’d given in earlier. So Granny’s updated. Wanna brag about a computer you love, or grumble about one you hate? Have you held on to things longer than you should? Traded “up” and wish you hadn’t? I love science. To me scientists are rock stars. Still, there are some times when I don’t understand the circular logic mainstream science uses to “prove” the mainstream view of things. Like the logic of this article. The vector (link) that moves Lyme disease from animal to human is a certain stage in the life cycle of a certain type of tick, this tick doesn’t bite humans in the South during that particular stage of its life cycle, therefore there is no Lyme disease in the Southern United States. 1.There have been cases of Lyme, or something with the same symptoms. 2. Ticks tend to bite no matter the stage or where they are. 3. There can be more than one vector. 4. There can be more than one type of bacteria that causes Lyme. 5. Not all cases of Lyme will present in the same way. Everybody is different. This scientific debate, or lack thereof, is more to me than just academic. My daughter has a friend who has severe symptoms and blood test documented Lyme Disease, but because she lives in the Southern U.S., and has been repeatedly told her symptoms can’t be Lyme—there is no Lyme in the south. OK, she has Lyme, but there is no Lyme in the South, so she can’t have it. Circular logic. Wake up, physicians and scientists, you are supposed to let the evidence guide you, not ignore evidence that doesn’t fit in your little world. Get the hell over it. Anybody out there have Lyme or symptoms that could be Lyme related? Had trouble getting diagnosed with an unusual illness? The Ugly Truth, now available. Secrets of Ugly Creek Secrets of Ugly Creek now available for Kindle and will release worldwide on June 25. 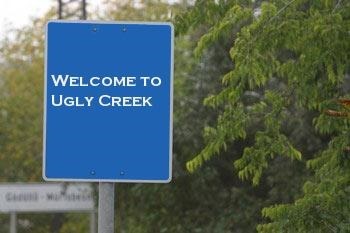 Those of you who read The Ugly Truth know about Ugly Creek. For those who don’t know, Ugly Creek is a tiny Tennessee town that exists somewhere between Knoxville and my imagination. After I wrote that book, I realized there were a lot more stories waiting to be told about the town and its inhabitants. In fact, Madison was yelling at me that she wanted her own story. So I gave it to her. The release date has come, and the second Ugly Creek story is now available exclusively for Kindle. Ugly Creek’s residents tend to be a little, um, quirky. And then there are the unexplainable things. The unanswered questions. The creatures that may or may not exist. In The Ugly Truth, Stephie discovers some amazing things about the odd little town and its unconventional inhabitants. Now, in book 2, Madison tries to keep the Secrets of Ugly Creek hidden from the rest of the world. Secrets of Ugly Creek is now available for Kindle, and will release worldwide on June 25.